If the 78% of Americans who don’t have a passport actually traveled around the world they would be shocked at how behind we are in technology compared to other advanced nations. Asia and Europe have more advanced wireless systems. Their fast trains make Amtrak look like it’s standing still. The President had to ride into Washington on Amtrak at nearly pedestrian speed, while in China you can ride the world’s first MagLev train from Shanghai airport. The train can reach 350 km/h (220 mph) in 2 minutes, with the maximum normal operation speed of 431 km/h (268 mph) reached thereafter. It cost a little over $1 billion to build – chicken feed in the age of trillion dollar deficits. An aircraft engineer once told me that Boeing spent more time worrying about making the seats two inches wider (to accommodate fatter Americans) then they did about improving aircraft performance. So now it is Airbus that has built the largest commercial aircraft (the 380), so big airports have to build new systems to handle them. A 380 is even being considered for the next Air Force One. Boeing needs to have a Concorde version that sips gas like a Prius as an answer, or we lose that lead also. The Japanese carmakers were the smart ones: focusing on hybrid technology while Detroit focused on making cars larger instead of better and more efficient. A hybrid SUV would have solved two problems – the need for space for kids, dogs, etc. but also gets 30+ mpg. The Merrill Lynch executives obsessed with $1 million decorating jobs “to feel right about their office” and Citicorp’s $50 million jet are more examples of leadership being focused on the wrong things. The good news is that we have the talent and technology to produce 21st century jobs and turn this economy around if we got our priorities right. We have a huge technology base at NASA that could produce next generation improvements from health care to travel, if we woke up to it. True story. A NASA engineer was in the hospital for a heart problem and began talking to Dr. Michael DeBakey – two worlds that don’t normally intersect. Dr. DeBakey told the engineer that thousands of people needed new hearts but had died before getting them because they had no way of providing a substitute. The engineer, from his bed, said “We have an impeller technology that drives the Shuttles engines that could work.” And sure enough, it did. Now we have people staying alive while waiting for a transplant because of NASA technology applied to a commercial problem. We need to bring these worlds together. We are no longer alone in the technology forefront. We cannot afford to return to our complacent ways, focusing on making seats wider instead of using our ethics and entrepreneurial talent to make things better. American economic revival will also require us to stay on the cutting edge by building MagLevs, smarter more efficient cars, a computerized health care system, and a new global financial system that works to build business for all of us instead of pyramid empires for a few. We need to get our priorities right and advance our technology base to be successful. President Obama's first crisis happened yesterday right after the swearing in - the collapse during lunch of Sen. Edward Kennedy. He did the right thing and rushed over to try to help the senior Senator. Somehow, it goes with the situation the President has inherited. Banks and homeowners are having seizures. Many are on life support. Not only does President Obama face a global financial meltdown, he also faces a disturbing trend that is melting down personal freedoms overseas. In Korea, a blogger was arrested for...blogging. Apparently the Korean government didn't like his financial predictions that happened to be accurate. It's another case of "shooting the messenger." What is so strange about this is that Korea has a democratically elected government. In Russia, a lawyer who had just held a press conference on a case involving a Chechen girl murdered by a Russian soldier, was shot in the head a few blocks away --along with a journalist who tried to help him. It's the latest in a series of execution-style killings of journalists and others who shed light on the darker side of Russian politics. In Nigeria, the religious police have blocked a rally by women who wanted to protest unfair divorce laws. China censored the new President's inaugural speech when he referred to "communism" --pulling the plug on him. With increasing unemployment for hundreds of millions of people thrown out of work by the downturn, China faces a potential political disaster they were able to avoid when times were good. In Thailand an Australian man was arrested for an obtuse paragraph he wrote in a book that sold only 7 copies - for supposedly insulting the King. The lines don't even mention the King, who is worshipped by Thai's, who need some international reality therapy. They should read a Hollywood Tabloid if they want to see some real insults. His sentence was over 5 years. Nuts. These challenges to freedom and the rule of law around the world will also need to be addressed by the President dealing with trillion-dollar deficits. It won't be easy but it will be necessary. We have entered a new era for America. Only in America could such as transition as happened today, from President Bush to President Obama,happen. But our Homeland Security was not helped by Sen. Cornyn's threatened filibuster of the confirmation of Secretary of State nominee Hillary Clinton. What is his point? He doesn't like Hillary? When the Ship of State has been put on the rock he is practicing the old politics of Tom DeLay -- instead of focusing on solutions. Sen. Cornyn's delay not only keeps the new President from having a confirmed Secretary of State to deal with our pressing problems, it hurts America after Sen. Cornyn's President put us in the the ditch. It is not constructive. Only 22% of Americans hold passports versus 71% in the UK. That means few of our people (and leaders) have had the opportunity of spending time in other countries -- knowing them as friends and people instead of just names on a map. That lack of experience by our leadership (GW Bush had been in only three countries before becoming President) has led to some major errors based on false assumptions of what other people are like in a world in which the U.S. is only 5% of the total world population. How many Americans know that we are entering the Chinese “Year of the Ox” (supposedly a good fortune year) – or about the Hindu’s Festival of Light - or that the Koran reveres Jesus and Mary? How many know that India is growing at 7% this year and that it is the largest democracy in the world? But that is about to change. Many of those in the new Presidential team have lived abroad at different times, making this our first truly international President and cabinet team. And since repairing the financial system will take a global effort, this bodes well. Newsweek published an excellent article on the international experience members of President Obama’s team have: Valerie Jarrett spent part of her childhood in Iran, Timothy Geithner grew up in Zimbabwe, India and Thailand; Marine Gen. James L. Jones, the incoming national-security adviser, lived in France for most of his childhood– and watched American civil rights struggles on French TV, a surreal experience. President-Elect Obama lived in Indonesia. (For the record, John McCain was born in Panama and also lived overseas as a child). I grew up on a farm in Iowa, but had the unique good fortune of being hired and sent around the world as a young corporate attorney. I have been to Indonesia and know how different Muslims there are from those in Pakistan. I have been to Islamabad and Karachi during a time when our Karachi Embassy was burned (in the 80’s). I have stayed in the Taj Mahal Hotel and Oberoi in Bombay (now Mumbai), long before they were attacked. Because of it I personally know Pakistanis and Indians, Egyptians, Latin Americans, etc. -- and how polite they were during my trips. I know that people around the world regardless of color or religion have the same desire to educate their kids, have a decent job and live in peace. Had I never left the wonderful farm state that Iowa is and somehow got myself elected to high office – and then picked to be a Vice President, or President, America would be poorly served. But not everyone who travels has an open mind. I still recall people I had to work with in the business world who spoke in racist terms, referring to “ragheads” and worse. Leaders who give the impression that they don’t respect other cultures cause America to lose influence and respect. “Saving face” is more than a Japanese cultural quirk. No one wants to lose face. Running America is a global job, not a local one. If you are clueless about the Japanese, the English, Brazilians, Africans, and so on, your ability to guide the American Ship of State through international waters is no better than that the Captain of the Exxon Valdez who sat in his stateroom while the crew piled his ship up on a reef. But as the Newsweek article points out, for the generation of Americans coming of age now, some of the most significant opportunities—for work, investment, recreation and learning—will be global. The number of Americans studying abroad is up to 240,000, more than double that of a decade ago, but it is still a tiny percentage. America will be better served by leaders who have spent time in the real world before going into high office. You never accomplish that from the back of a limo or on a deck chair of a cruise ship. I wish the new Presidential team Godspeed and Good Luck. It's not often that a commercial airliner turns into a floating life raft. The Chinese say that this "Year of the OX" is usually tied to good fortune. It certainly was for 155 people on the US Airways Airbus 320 - or perhaps we should call it a "water bus." I still hold a commercial pilot's license. In emergency training, pilots learn that the most dangerous part of a flight is the take-off. The plane is loaded with fuel and a failed engine during ascent means big trouble --it's easy to stall quickly and lose control. A bird strike can break a pilot's windshield. In this case birds took out both engines. You have seconds to react by dropping the nose (to keep from stalling) to set up a glide while looking for a landing spot within reach that doesn't involve trees and sharp objects. Finding that in a place like New York (or over the Piney Woods of East Texas) is virtually impossible. For the pilot, there is no time in an emergency to call for a committee meeting, ask advisers, or dial 911. There is no time to be indecisive. You don't get to replay the simulator if you get it wrong. Just make the best decision you can based on your training and the situation -- and do it. A few years ago, I was flying a Cessna 182 over Lake Houston when all the instruments went dark due to an electrical failure --the only thing working was the engine. There was no way to radio anyone. The gauges were no longer working so I didn't know how long the gas would hold out. Tall pine trees ruled out a landing. When I got to the Lufkin airport we had to pump the landing gear down by hand. I got it down on a runway without having to land in water - and had enough adrenalin going to help me get through a kidnapping later that same day. The US Airways crew had the sense not to open the rear doors of the cabin which would have allowed water in, causing the plane to sink in frigid waters. That would have meant a quick death for anyone caught in 36 degree water. Kudos to the NY ferry boats and others that saw the landing and pulled up to the plane floating downstream to rescue passengers - well before the first responders were able to arrive. 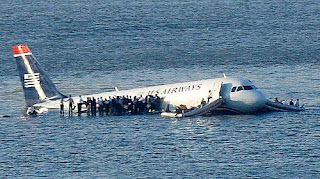 So the pilot of Flight 1549 pulled off a miracle on the Hudson. Let's hope this is the first of a series of miracles this year to pull our economy out of the same kind of free fall. We need pilot-President Obama to guide us to a similar soft landing after the economy has taken some major hits during its climb-out. Texas legislature - Update our building codes! The Texas legislature is open for business. I suggest that they take serious action to update our building codes to avoid billions in future losses from storms. IKE damage mainly roofs and windows, but the cost is much more than replacing a roof or window. A breach of either leads to extensive water damage that buildings are still attempting to recover from. People lost records, offices, the ability to work, etc. Over 900,000 claims have been filed so far. All this could be avoided simply by requiring better roofs and by adding security window film to keep out wind-borne debris. Billions in insurance and property damage would be prevented. On top of that our security film would cut energy use - about 50% of the energy loss of a building is through its windows. I recommend that you make your suggestions for improvement to the House Committee on Hurricane IKE - tomorrow is the last day to get into their report. Yesterday I attended the House Select Committee Hearing on Hurricane IKE held in Galveston. One of the public speakers made a fascinating point. He asked that the standards for asphalt shingles be changed so that they are nailed with six instead of four nails. The lack of two nails led to the roof damage caused by IKE. He said that roofs in Beaumont after RITA that had been replaced with shingles held by four nails were torn off again by IKE. Roofers are putting on 500 new roofs a day in Houston, and after the next big storm they will be doing it again. The warranty on the shingles (using four nails) is only 60 mph! Why? Because they will fail at 70 mph according to this witness, who is an engineer. This is but one of the many suggestions for code improvements that the legislature is looking at. Rep. Turner and the committee spent the entire day listening to testimony - without even breaking for lunch. Another issue raised by Rep. Eiland himself was the adjuster problem. He said that he is having to deal with 7 adjusters! There is one for flood, another for wind, a third for car damage and more adjusters for a second piece of property he owns. Like many residents, he wants it changed so people are dealing with one adjuster (or a lot fewer)! From my perspective we also need to address windows. Galveston requires impact or hurricane glass but that is very expensive for those further inland. Yet Houston high rise buildings had windows blown out starting at thirty feet or higher, where the wind speeds were higher. This could have been avoided by using our hurricane window film with a special DOW attachment to the frame. One bank on the west side lost its computer when a glass door blew in. The computer loss wasn't so bad as the fact they also lost all the data on it. Our window film would have protected both people inside and the property that was destroyed by window failure. Sun Breaks Out in Seabrook. Yesterday the same view was black with rain. I just heard the best analysis of the situation in the Middle East by Martin Indyk in an interview on "Morning Joe." He says that the Israel attack on Gaza is playing into the hands of HAMAS, who was losing popularity the population until they were able to start this war. The people in Gaza could see that their lives were not improving while Palestinians in the West Bank have seen improvements. So HAMAS had to start a war to stay in power. Now, Indyk says, that Muslims all the way to Indonesia are rallying to their cause. He calls for an immediate cease fire. It's time for a new team to take over in Washington to address these difficult issues. This administration seems to be out of gas and out of ideas. We are entering a new era as a result of the meltdown. By fighting other countries and allowing Wall Street to drive drunk, and GM to skate instead of innovate, this administration has ironically made it mandatory for America to cooperate with the nations of the world - to fix this global meltdown and avoid future disasters. In 2000 America had a budget surplus (inherited from Mr. Clinton) and the global strength to be a monopoly power. All that has been lost in the past eight years. Since we sold all the bad paper that helped drive the world to a global depression, it will take a global strategy to bring America out of this situation. The SUN finally broke out this afternoon, after a day of rain -- and days of dismal clouds before that. I have been offline for days, trying to get Quicken -- and then Quickbooks -- to simply give me the P&L numbers from ONE account so I can calculate profit and loss for the IRS. But noooooo. That would be too simple! Instead, it lumps together numbers from several accounts - then makes filtering out all the rest difficult. Why can't it just give me the income and expenses from just one account - and keep it simple and easy? But then, why couldn't GM see that making hybrids along with SUV's would be smart business? Maybe its the sign of the times. The next Chinese New Year will be the Year of the Ox - I was born in the year of the Ox, so hopefully it means a good year. I have just one question for Mr. Burris that I haven't heard the media ask: Did Gov. Blagojevich ask you for anything for the Senate seat? Or did the Governor finally really do the right thing (for a change) and offer it without something being demanded in return? If nothing was offered or promised in return, then Mr. Burris should get the seat. We have enough trillion-dollar crises and two wars going on without getting into a silly fight we don't need. But if Mr. Burris offered Mr. B anything for the seat, then Leader Reid has done the right thing. It's a strange tale. Between this and the Coleman-Franken landslide of 225 votes, its been fascinating to watch. By the way, I understand that Gov. Blagojevich has won the Tom DeLay "Ethics in Government" award for 2008. Or maybe I just dreamed that. How's this for funny--Sen. Cornyn has announced plans to filibuster Mr. Franken's Senate seat, which he claims a win by a scant 200 votes. However, Mr. Cornyn supported Mr. Bush's Presidential win in 2000 -- by 200-odd votes. Hypocrisy is not a lost art. Change is in the air - even Speaker Craddick is out - the Texas legislature has had enough of Tom DeLay-type rule and a new era of moderate leadership is breaking out. That bodes well for our State. But the national and global story is not so great. The scenes in Gaza are so horrific that the BBC TV won't even show the pictures - although the international media have not been allowed into Gaza for days to see what is happening (remember, our TV media was in Iraq even during the worst of the fighting). The situation in Gaza is ugly and one sided. Jet aircraft vs. home-made rockets. Civilians in the middle. Today it was announced that Israel jets hits a UN school in Gaza, killing dozens. America is the only country that is not seriously trying to do something about it. As pointed out by Dan Rather on "Morning Joe, these grim photos from Gaza strengthen IRAN's hand and power. How does that help Israel? Most Americans don't realize how this can affect our future security in a negative way, even when they think it is doing the opposite. I was struck by the fact that Pres. Bush declared genocide is happening in Sudan, yet he has taken no real action to do something about it. I don't understand how one can recognize genocide, yet not do anything. This studied inaction is puzzling. The bottom line: our security remains fragile. People need to be prepared for anything. Our indifference to some horrific suffering around the world could easily end up kicking back on us - in the form of a future terrorist attack by people upset at what we have -- or have not -- done to fight for justice and fairness in the world. In a nuclear world, that is not a good thing.